Holy Beach Book! 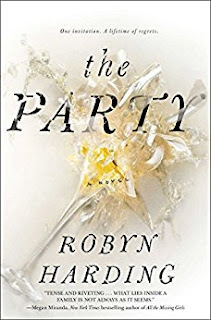 If you are looking for an exciting, intoxicating, fun summer read, you need to add The Party by Robyn Harding to your beach bag right away. I started this book on the car ride to our beach destination, and I could not put it down. I finished reading it in the hotel room in the dark beside my sleeping husband and children at our halfway point. In other words, it was so good, I finished the book before we even made it to the beach – in one day. The Party goes back and forth between the events on the day of a special Sweet Sixteen slumber party and the days after because this party becomes a quintessential before/after event. At this party, hosted by perfect parents (or a mom trying desperately to be seen as perfect), one of the teenagers suffers a life altering injury. How? Because these teens snuck in booze, drugs, and boys – all against the rules. Therefore, the novel spins off into a story about who is to blame for this tragedy. The hosting parents who vehemently deny any fault or blame? Or the girls themselves? Specifically, the injured party who has a reputation for trouble? As a mom, I hated all the moms in this book. I hated the perfect acting mother because she was so bent on protecting her own name and reputation rather than on the repercussions for the teenager girl. I hate the injured girl’s mom for focusing so much more energy on her anger than on helping her daughter. I hated the mean girl teenagers who show how finicky popularity in high school is. But, I loved hating them. While reading, Harding continued to surprise me. I was sickened by the actions of characters – and surprised by them time and time again. In the end, it was the teenager girls who made me the most proud. They stood up against bullying and for what is right. Not the parents. The novel also was relatable. It is so easy to think you can do everything right parenting wise and still end up dealing with things so beyond what you planned for. It made me question what I would do in a similar situation – because the situation is realistic and not far-fetched. Everything in this novel could happen…you just really really hope it doesn’t. If you are looking for a fun book to escape into this summer, you must pick up The Party. You won’t regret it.